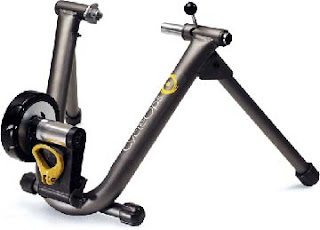 After the weather we've had the past week, what with record-low pressures and crazy-high winds, it's time to consider an indoor trainer -- a great way to maintain a degree of cycling fitness during the cold-weather months. And it's essential: Just two weeks of inactivity will result in a noticeable loss of strength and flexibility. In 8 to 12 weeks, the cardiovascular fitness you developed this past summer will be all but erased if you don't keep up with a cycling regimen. So where to start? We recommend your local Century Cycles, of course! Come check out the array of trainers we have in stock and discuss the features you need (and the bike you'll be putting on it) with a member of our helpful staff, many of whom also cycle indoors in the winter. And did you know that you can also take a trainer for a test ride, just as you would a bike? As for what's in stock, we carry: Blackburn TrakStand Mag Trainer ($159.99), Blackburn Tech Mag Trainer ($229.99), CycleOps Magneto ($269.99; pictured above), and the CycleOps Fluid2 Trainer ($329.99) -- along with all the indoor training accessories you may need such as climbing blocks and training mats. Warm up well -- 5 minutes minimum (or 15 if you're planning a strenuous workout). Devise a workout strategy -- vary your effort to work on speed, endurance or power. Include easy or rest days -- allow your body to recover from hard training and grow stronger. Limit yourself accordingly -- ride outside as long as (or whenever) conditions permit so as not to burn out on indoor cycling. That said, an indoor trainer will keep you sane during a long winter and have you ready to ride when the warm weather comes!